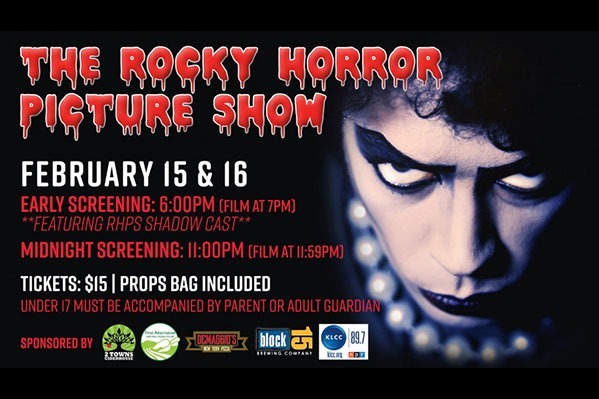 Concerning all Rocky Horror Creatures of the Night: Add a little Transylvanian magic to your VDay with the Majestic's Rocky Horror Picture Show Experience! Come early and have a photoshoot with friends posing with Rocky Horror Face-In-Hole cutouts or lounge in the Doctor's throne on the stage under the Transylvanian Convention banner. Schedule: Feb. 15 and 16; Shows at 6 p.m. (film starts at 7 p.m.) and 11 p.m. (film starts at midnight).